Let me start by saying that this has got to be my craziest and funniest one yet! When my co-worker Jen asked me to design a cake for her sister's beautiful age of 5-0, I did not hesitate to say yes. 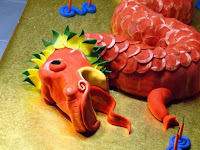 I am glad that I took on this cake. I asked Jen about her sister to get ideas for the design and it turns out that Jill loves to cook, and has a great sense of humor. I first started sketching out cakes that were stacked for a more elegant approach, then I tried a 3D approach and sketched a cake that resembled a butcher block cutting board with diced veggies and an chef's best knife upon it. Then as Jen reviewed these and saw one that had a mini stove place at the top layer, "How about just a stove?". "How about a stove with her stuck in it? ", says I. "Love it!" I searched through pages of images and came across the perfect pastel blue retro oven stove to put lovely Jill in. The baking of the cake and the elements of the stove was the easy part. It was the element of Jill's legs sticking out of the oven and the oven door slightly ajar that was baffling to me. I had to come up with a way to keep gravity from pulling down the angled door and rip away from the cake. Not only that, but to be able to support the weight of the torso and legs. 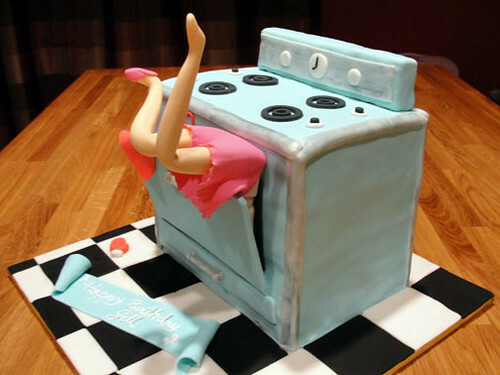 A cake falling part is a baker's worst nightmare! After some careful planning, I modeled mini Jill's torso and legs out of a 50/50 mixture of fondant and gumpaste two days ahead for the proper amount of drying time. 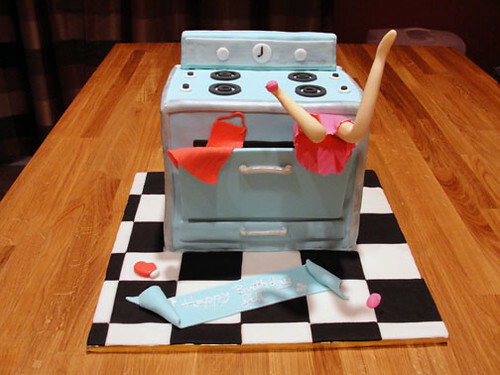 I did the same for the oven door, but only used gumpaste tinted with a touch of blue fondant to match the color of the rest of the stove's pastel fondant. Using a template that I cut out of cardboard, I shaped black gumpaste wedges to act as anchors to attach the door to the front of the cake. The cake was baked a day ahead of time prior to assembly to allow for it to settle and cool. The sheets of my spiced chocolate cake were cut in half and stacked and filled with cinnamon buttercream. 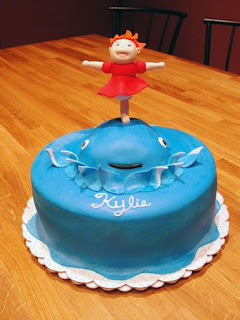 The 8" tall cake was then covered in the same and wrapped in a pastel blue blanket of fondant. 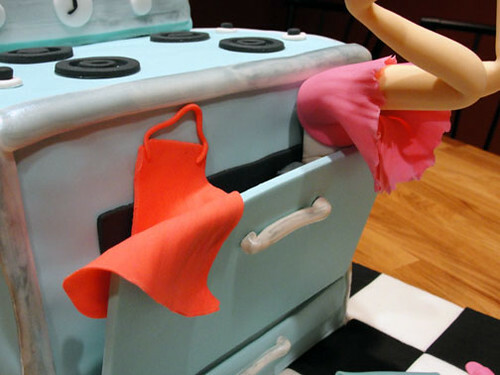 The little details were cut out of fondant and gumpaste and attached on to bring the stove into reality. Using two bamboo skewers and gum glue, the door was attached and propped in place to dry. The torso was covered in pieces of clothing and slid into position. The legs were modeled around bamboo skewers and I used these to attach the legs into the cake. Rolling out a sheet of pink fondant super thin and ruffled with a veining tool, a realistic skirt was fashioned and drapped around the legs. To exaggerate the situation of the cake, one slipper place on a foot with another on the black and white tiled floor. An apron was draped on the oven door opposite from the legs for visual balance. For the final touch, I brushed on silver fondant glaze for a weathered chrome look. Don't you love it? I do! Yes. 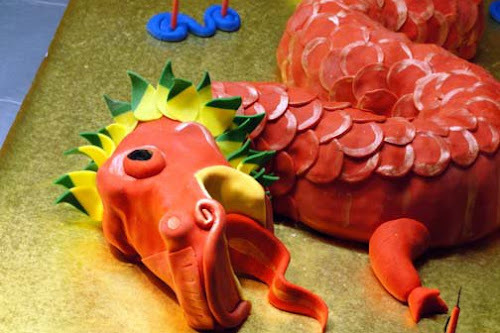 I do love fondant, but not everyone likes fondant. 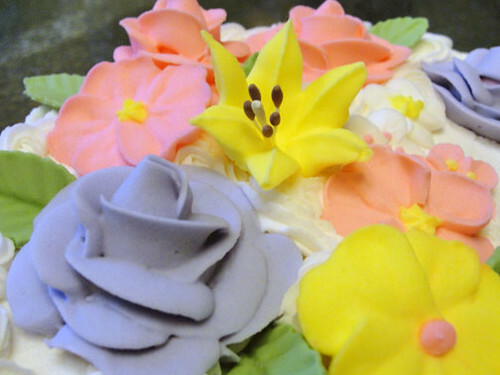 Some people just love or prefer buttercream, but I'm not a buttercream expert. I started decorating cakes backwards. I tried running before I could walk. 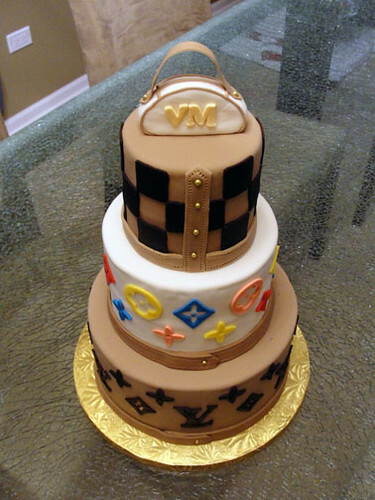 I started carving cakes before I could even bake one. 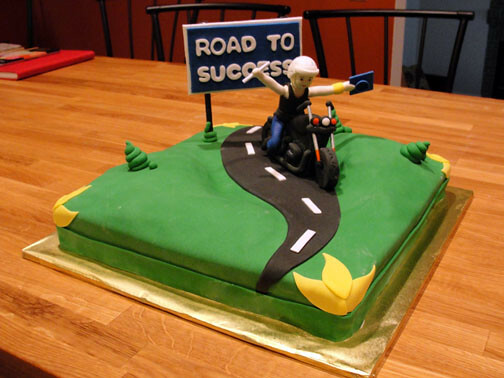 Recently, I decided to take some classes and freshen up my piping and buttercream techniques...time to put on some training wheels!!! I took some local classes, and it was worth dragging myself out of bed every early Saturday morning :) My fear of piping borders were subsided and my appreciation for the fluffy and sweet icing was renewed. No more filling in spaces with a star tip for me! You want a bouquet of roses? I got roses!... You get what I mean, right? Most of all, I can now ice a cake like it's super smooth plaster on a wall. Except, it's edible and really good. Yay for buttercream! This adorable cake was made for Samson and Preston, father and son who share the same birthday. How sweet is that! The cake assembly part was rather easy compared to coming up with the concept and design. 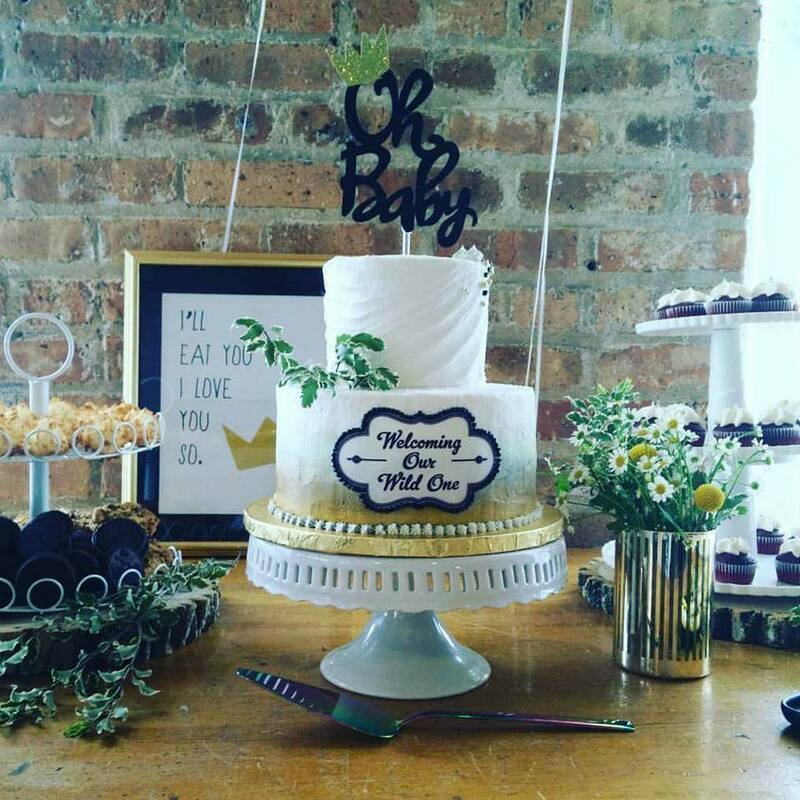 What can I do to tie in their relationship and present a cake that was custom to them? Samson like billiards, but what about Preston? I hear he likes the cue ball?! Samson likes cars, and Preston likes Cars from Pixar. They both like the beach and sea animals... sea animals... father and son sea animals! Starting with a 8" round pan and a 6" round pan, I poured in my fave vanilla butter pound recipe. These bake up light, moist, but still dense enough for carving. 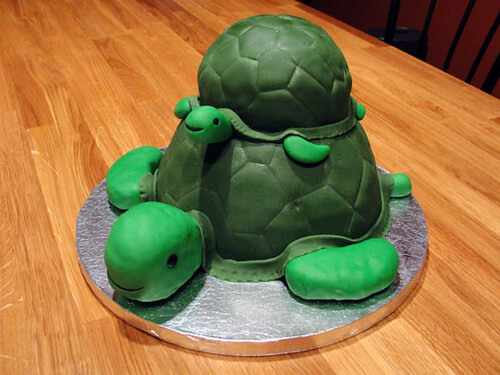 The layers were first filled with some sweet and cream buttercream and then each one was freehand carved into the distinct shape of a turtle. A thin blanket of buttercream was smoothed on and a green blanket of fondant was laid over each one. Using a gumpaste veining tool, I etched in the recognizable pattern of a turtle shell. The head of the daddy turtle was shaped out of some gooey cereal treat and received a layer of a slightly brighter green. 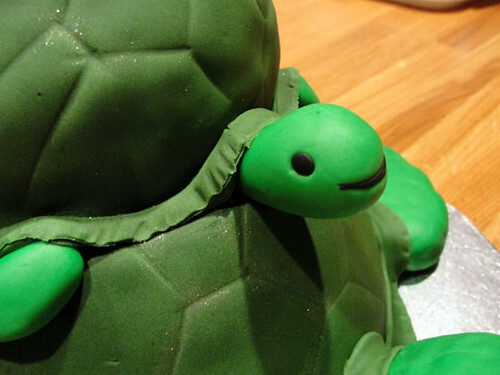 More of the same fondant was hand sculpted into the remaining parts and to finish off the baby turtle. I shaped some black fondant for the eyes and lovely smiles. The little one was stacked above the big one and Voila! Aren't they cute?! Happy to Samson and Preston again! I know that it's still the end of August, but I can't help and think ahead when orange hues surround us and a certain scent of spice fills the air. 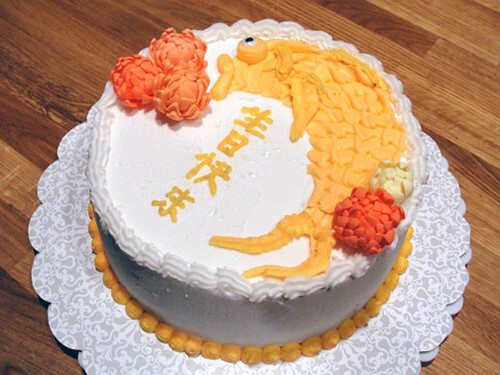 Here's a birthday cake that sings autumn inside and out. I started with a basic chocolate cake recipe and added a touch of heat... cayenne pepper that is. 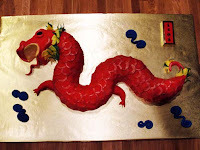 It gave the moist sweet cake enough heat to just tickle the back of the throat in the finishing. Three 2 in. high layers nestled between fluffy clouds of cinnamon buttercream...can't you just smell that spice in the air! More of the yummy buttercream thinly covered the assembled cake before I laid down a smooth blanket of dark chocolate fondant...this stuff taste like tootsie rolls. 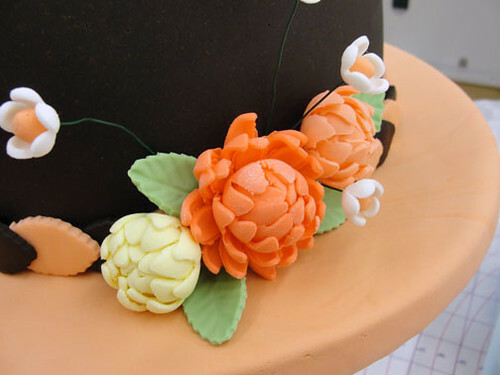 The covered cake was then gently placed on top of a covered cake board, and bordered by alternating leaf cut outs, overlapping for a wonderful affect. 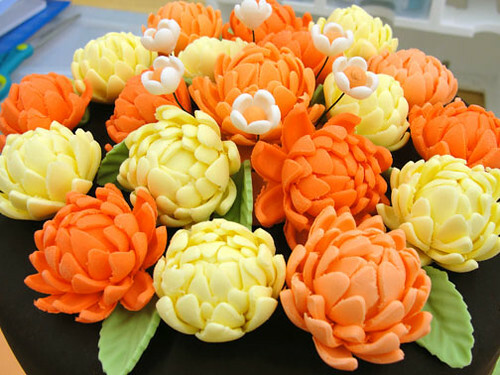 An array of gum paste mums that I had made a day in advance were then positioned on the cake for a lovely autumn touch. Enjoy! Sonorama Chicago cake gets moving! Earlier this month, a special man by the name of Edgar Baca turned a wonderful big 3-0 and my inner cake addict just wanted to make something that spoke to him. My main inspiration was a podcast called Sonorama Chicago that he ran with a good friend. The main image on this cake is a reproduction of an illustration that they use on their promotional media. I sketched up several designs and decided on one that complimented the colors and the personality of the birthday boy. 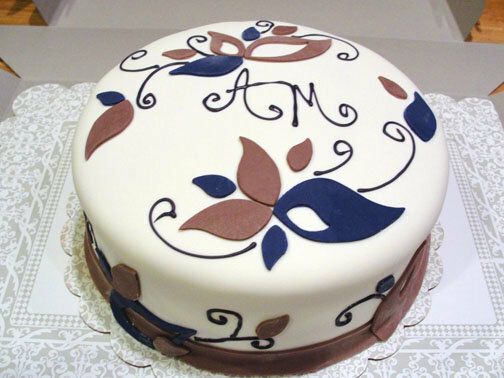 I decided on a 4 layered 9" round cake covered in a tritone design of simple and whimsical lines. A dark chocolate cake nestled between clouds of nutella and chopped hazelnuts. The layers of cake then received a thin blanket of buttercream before a smooth finish of fondant. A template was used to cut out a 2.5 in. hole out of the cake centeer to fit the motor...yes, one that rotated the printed plastic disc that I designed. 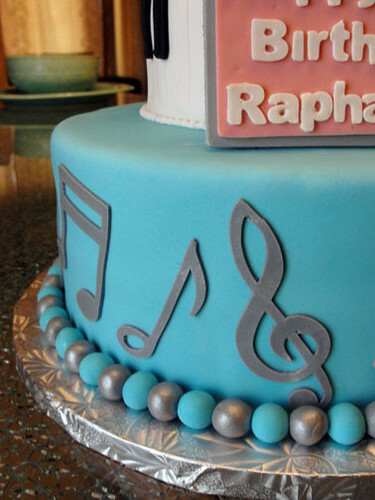 The cake looked like a whimsical, cartoonish record player...just like the fun birthday man himself! Oh, did I mention the flashing LED lights?! Here's a VIDEO of the cake in action. Enjoy! 13 months ago, I was blessed with the birth of my first son, Mateo. He has been my pride and joy, and nothing was more exciting than planning his first birthday... okay, it was mostly about his cake! How could I just make a normal birthday cake? Being who I am, I had to go a bit 3D. 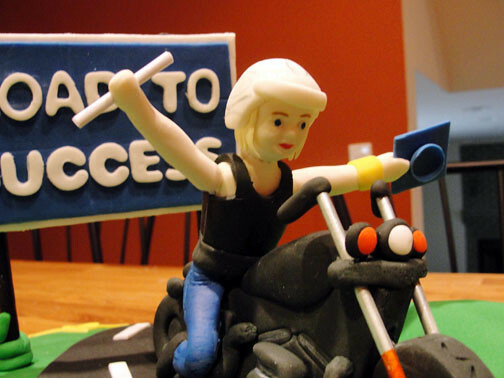 I have to admit that I was inspired by Duff and his cake creation for a couple that collected designer toys. What would be more perfect than a "M" Dunny for my lil Mateo. He was going to be a lucha libre, sporting a cool mask with a "M" on his forehead. It was going to be awesome. Also an artist, my husband worked on sketches of the "M" Dunny, and I sketched up the size, shape, and the structure of the cake. The Dunny was built from the bottom up, each layer supported by cake board and dowel rods. The bottom part of the legs was carved out of cereal treats, and seamlessly attached to the torso carved out of pound cake. The Dunny's head was baked in a sport ball pan and then carved into it's distinct shape using a template I made out of board. 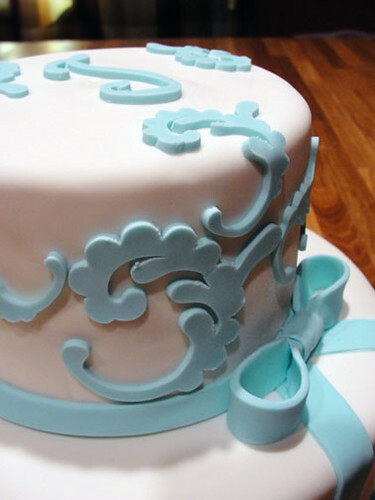 Each section was lightly iced with buttercream, and received a smooth layer of white fondant. Arms and ears were shaped out of cereal treats were also covered with white fondant. My husband then painted each part, closely reproducing his sketch onto the 3D shape. Colors were created by mixing gel colors and a touch of water. A shimmering metallic silver was achieved by using a silver Cake Graffiti by Duff...yes, I do love that man! A wrestling ring becomes the base for this cake and was made from my signature red velvet cake filled with coconut cream cheese...Yum! I wrapped candy sticks in black fondant and wound Twizzler pull and peel candy strings around the ring as rope. 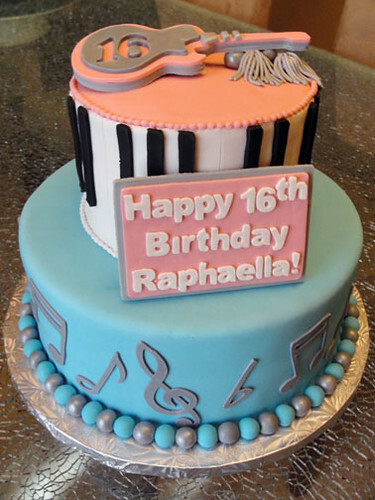 The whole cake is literally edible! Summer is here, and it's a season for nuptials. A few weeks ago, Stephanie and Charly exchanged vows and shared their commitment to each other with friends and family. Being a graphic designer, I designed their wedding invites, and naturally, I was thrilled to take on their wedding favors. I didn't want to just bake the run-of-a-mill favors like personalized cookies or candies, yes, I also dabble in the chocolate world. I wanted to tie into the colors, theme, and location of the wedding. I wanted to make something that would be enjoyed by them. The end result were a hundred mini three tiered wedding cakes! 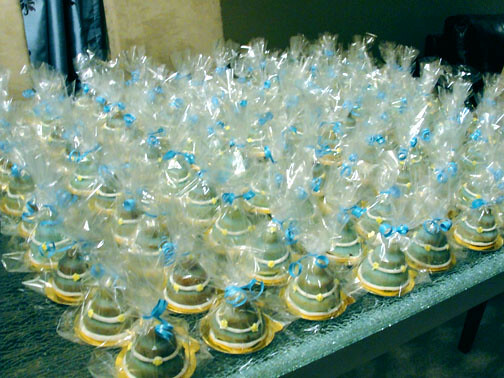 I started the production of these mini treats two days prior to delivery. The first night was only for baking and glazing the cakes to seal in moisture. The batter was a basic yellow cake recipe in which I added fresh lemon zest and creme bouquet. 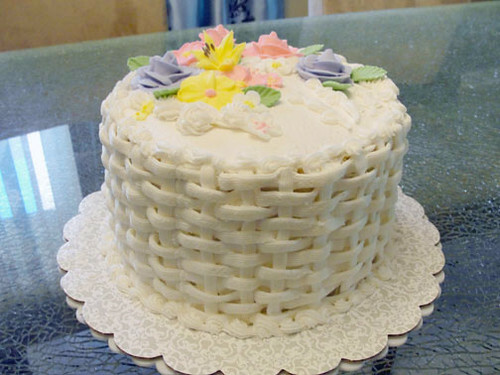 I used three tiered cake pans I had purchased online, kinda cheated on this one..hehe! After the mini cakes were cooled and removed from the pans, I glazed each one with a apricot glaze. For a simple apricot glaze, simply heat apricot jelly or marmalade in the microwave to liquefy, then strain to remove bits of fruit or rind. 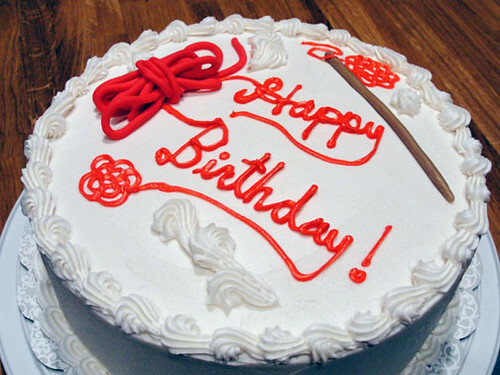 Use a pastry brush and gently brush on a cake and let it set. Doing so will keep your cake moist. Day two was the night to enlist volunteers for an assemble line... time to decorate! I don't think I could've made it without the help of my husband, Adrian; my youngest sibling, Linda; my friend, Eumi; and my unsuspecting lil cousin, Viviann. THANK YOU GUYS! Like a rusty train... it was a bit hard to get going at first, but once we got into a groove, we were cooking with gas...or delirium had set in and we thought we were. 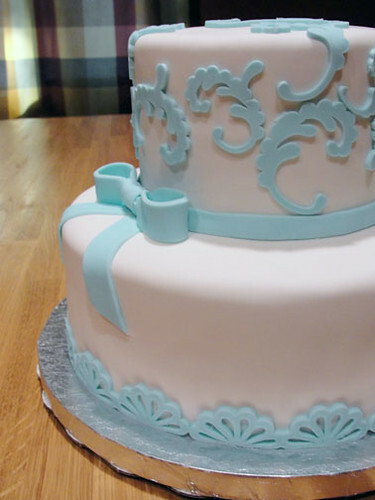 I covered each cake with pastry fondant tinted with a light blue, and let them cool to an almost transparent finish. The warm color of the cake peeked through just enough, so that it wouldn't look too much like soap and no one would eat them. Sorry, that was one of my crazy worries. 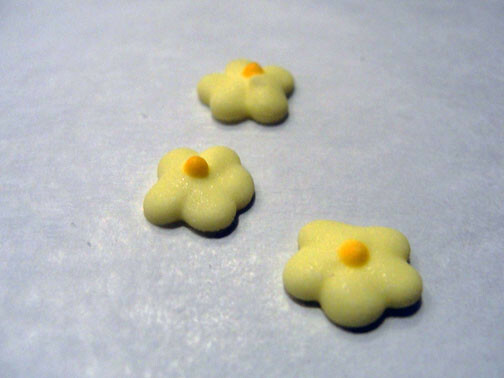 Once cooled, my helpful volunteers (more like ones whom I've coaxed) attached thin ropes of white fondant, and attached yellow royal icing drop flowers that were made several week prior. 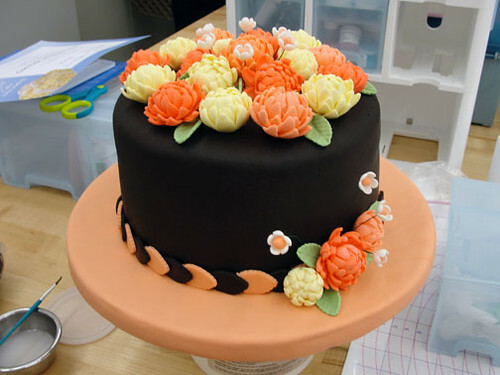 Once royal icing flowers are made, they can be stored for a long period of time. 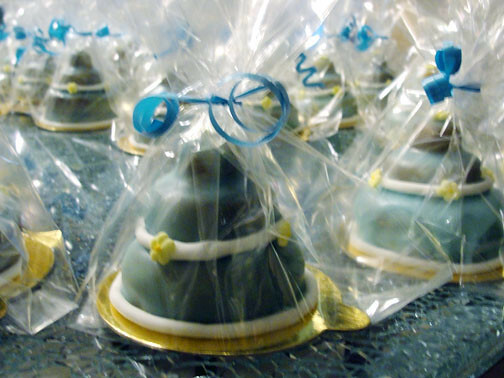 These little cuties were then bagged and finished with a matching blue ribbon. Once again, Congrats to Stephanie and Charly! I hope your guests enjoyed these and were as happy as you two! 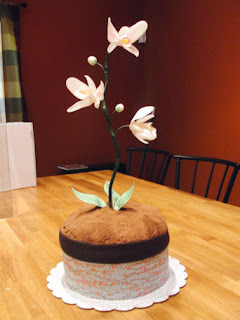 This weekend brought forth a new challenge when Eumi asked me to make a special cake for her mom's 50th birthday. Of course I would! How could I ever turn her down? The details entailed bright colors, flowers, and fruit. 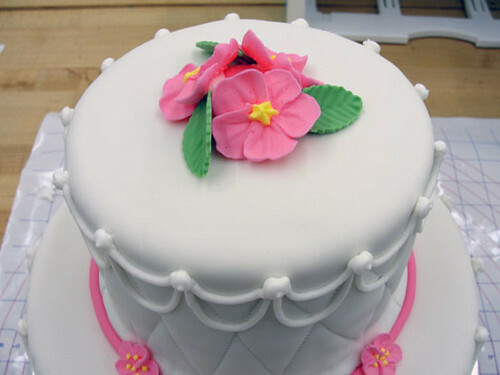 I spent most of the day combing over different ideas, and the idea of making a normal round cake with flowers piped or attached to it just seemed boring. 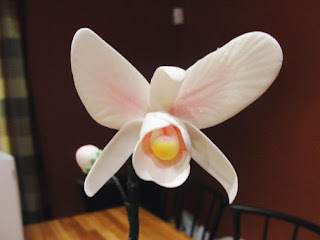 Naturally, the concept of gum paste flowers popped into my head. I got very excited, and then I got scared very quickly. I have never made gum paste flowers before, nor any that looked realistic. Boy, this was going to be interesting. 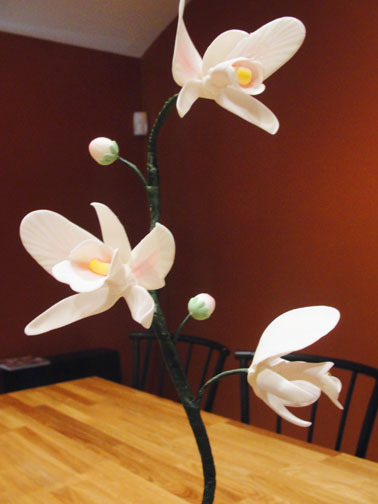 The design of the cake was based around the idea of a beautiful flower, and after checking with Eumi, her mom's fave orchid. I sketched the concept of the cake on paper and worked out the details of the cake. The cake would make up the pot, and would be the base to a single blooming orchid plant. Layers of yellow butter cake flavored with creme bouquet were nestled between layers of fruit cocktail mix and pastry creme. Stacked 6 layers high, the cake was covered with buttercream to seal in the freshness. I then rolled out a wide strip of dark chocolate fondant to wrap around the cake for the pot, and followed by a strip of Japanese decorative paper for a beautiful accent. Hope her mom loves it! Combine heavy whipping cream and sugar in mixing bowl. Whip until soft peaks develop. Add gel and vanilla, then continue to whip until stiff peaks. Remember to not over whip or you'll get something like butter. 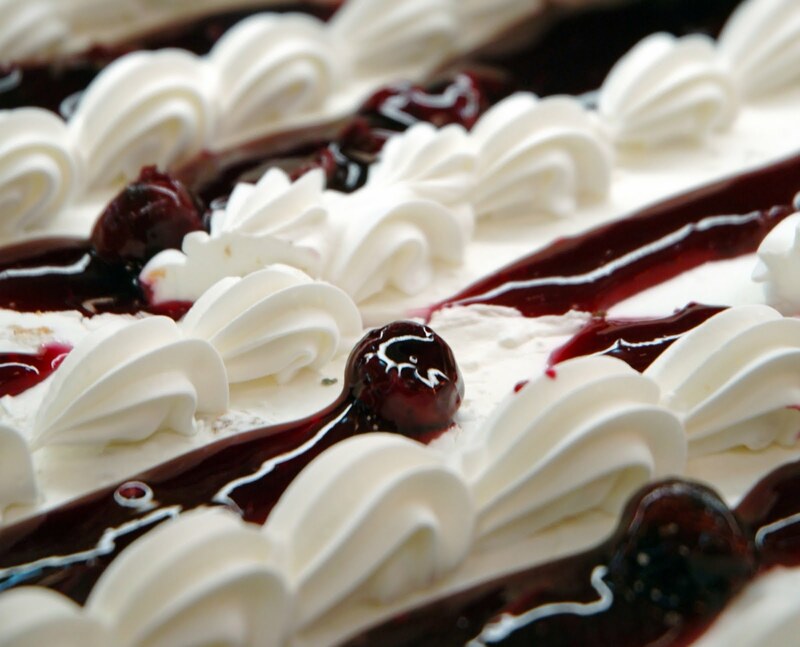 This whipped cream is perfect for topping off your desserts, smoothed over your cakes, or piped on as borders! When the month of May came around the corner, I knew that I had to come up with something cute for my youngest sister' birthday. 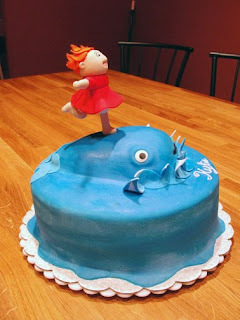 Last year, I made a couple dozens of cupcakes filled with mousse and added a solar-powered bobbing miniature of her grinning away :) This year, I wanted to make her a cake that would challenge myself and put to use the techniques I've learned from books and online tutorials. 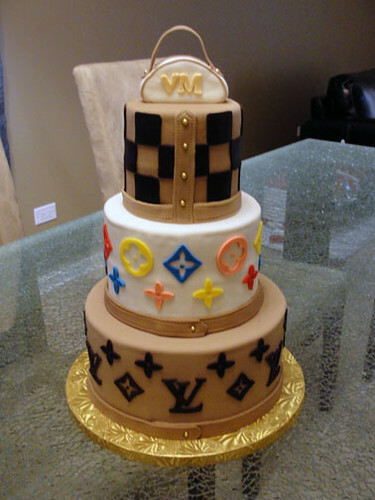 Most of all, I wanted to surprise her with a wonderful cake. 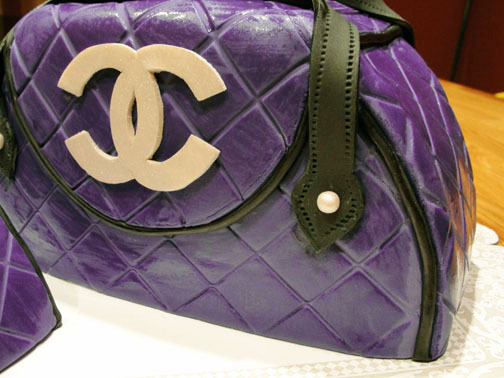 What could be more wonderful than a Chanel purse? I sketched what I wanted to create, how to shape the cake, and details to incorporate. I started with two 10" round cake pans, one with chocolate cake and the other was a cocoa pound cake. I chose pound cake because of it's dense texture. I wanted to make sure that the cake could stand up on it's side once I assembled it. I made templates for the splitting the two cakes into the larger purse and the smaller case. With the cake split and cut into the correct shape, I began assemble the cake by filling each layer with alternating fillings of chocolate bavarian and whipped cream cheese cream. The two were then crumb coated with buttercream and ready to transform into a purple purse. Using templates I've cut out of cardboard, I cut out pieces of purple fondant imprinted with a diamond pattern. 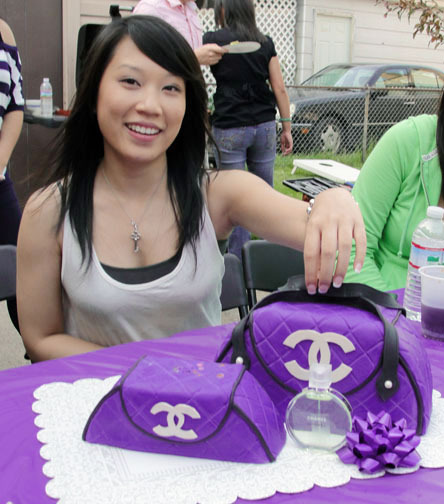 The purse was finished with some black fondant trimmings and handles detailed with stitching. And the bling? I wouldn't leave that out. 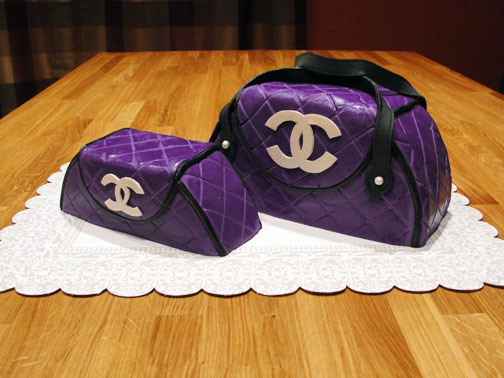 I cut the Chanel logos out of fondant and covered it with some shimmery silver luster powder and adhered them to the finished purse cakes. Happy birthday Linda! As a former barista, no work day was complete without packs of these yummy cake-like cookies. It didn't take me long to realize that these little babies were going to run my paycheck dry. I always admired how lovely they look, just meant to be sold in boutique bakeries, and too sophisticated for my home oven. Boy, was I wrong! Like destiny, I received a book for my birthday that magically fell open to the very page of this very special recipe. Oh sweet Madelienes! The recipe couldn't be easier. I instantly jumped online and found madeliene pans and awaited their arrival. The moment the box arrived at my door I was in the kitchen baking. 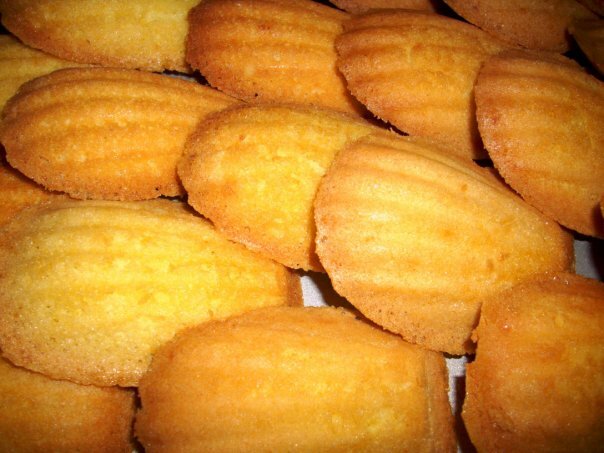 Such simple ingredients came together and warmed the senses with a room full of these petite French cookies. Bon Appetit! I guess you can call me a design-a-holic with a love for cooking, crafts, and baking! I recently started making custom and specialty cakes for friends and family. It's become an addiction actually. I spend my free moments dreaming up new flavors, and researching online for new techniques. My kitchen becomes my classroom where I'm self-taught. Some days I'm exhausted from the lack of sleep, but the smile I get when they see the cake is all worth it.